Luke and Heather Bell, Owners. Pasture raised poultry and eggs. Variety of vegetables, herbs, fruit and cut flowers. Jennifer Wixtrom, Owner. Seasonal produce, rhubarb, onions and garlic, lettuces, gooseberries, eggs, flowers, bracelets, games, and wooden crafts. Polish and breakfast sausage, pork loin roasts, pork ribs (babyback and square), bacon (smoked and uncured), chicken and organic feed pasture eggs, and various vegetables and fruits. Meat such as pork, lamb, goat, and beef, herbs, and a wide variety of fruits and vegetables. Ryan Fairbanks, Farm Manager. Coffee (beans and brewed), pretzels, donuts, and fresh produce. Hot peppers. A variety of vegetables, apples. Naturally grown fresh vegetables, flower, herbs and vegetable seedlings. Charles and Miriam Devooght, Owners. Fresh produce, maple syrup, baked goods, compost manure, topsoil, fall decor, and christmas trees. Seasonal produce, flowers, micro greens and unique salad mix. Micro greens, vegetables, plant starts, garden signs, cloth napkins, and dry & fresh herbs. Organic grass fed beef and maple syrup. Fruits, vegetables, beans, and herbs. Eggs, mohair, llama and Shetland wool rovings, yarn and raw fiber, natural colors and hand dyed. Cut flowers, perennials, produce variety. Seasonal vegetables, eggs, maple syrup, flowers, starter plants. Mushrooms, berries, vegetables, honey, microgreens, roots, leafs and fruits. Produce, honey, dried vegetables, jams/jellies, plant starts, aprons, earrings. Rowan and Shaila Bunce, Owners. Vegetables, chicken, herbs, and flowers. Jeff and Leanne Hatfield, Owners. Certified Naturally Grown, vegetables, fruits, herbs, mushrooms, maple syrup, eggs, flowers, pasture raised pork, grass fed beef. Randy and Libby Buchler, Owners. Eggs-Soy/wheat free, and WoolyMama clothing line. Jason and Jennifer Slagle, Owners. Produce, dehydrated produce, herbs, plant starts, fruit, meat, eggs, pasta, maple syrup, jam, baked goods and sugar scrub. Lester and Sharon Perkins, Owners. Mushrooms, honey, jelly and maple syrup, vegetables, blackberries and apples, vegetable starts. Produce, plant starts, flowers, maple syrup, honey, jams & jellies, dried herbs, baked goods, wild foraged foods, woven rugs. Specializing in Brussels Sprouts, also rhubarb, squash, tomatoes, cakes and bars. A variety of seasonal produce and wood burnt art. Hand-spun yarns, knitted goods, woven shawls, felted sheep wool, rovings and sheepskins. A newly established family owned, all natural farm specializing in wild raspberries to begin with and more to come. A native plant and wildflower nursery that specializes in local genotype flora. In addition they have a complimentary apiary and sell raw, local honey. Apples, 30 varieties, sweet cherries, pears, plums. John Williams, Owner. Mushrooms, ready to fruit mushroom logs, mushroom compost, fiddle-head ferns, ramps and wild leaks. an off-grid homestead utilizing solar power and wood heat to grow heirloom fruits and vegetables year round. Beets and other root vegetables grow well in our upper peninsula climate and store well too. 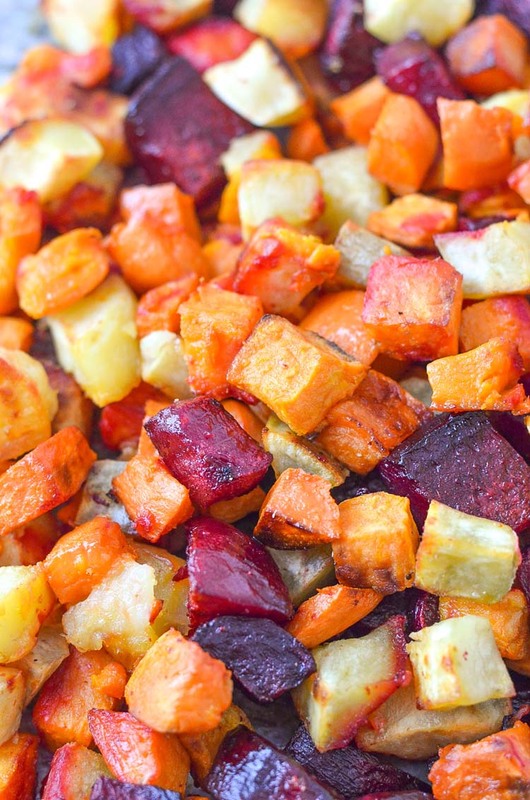 Roasting vegetables is a quick, delicious side dish or meal. When you want beets raw, grate them and use on a salad or stir into other side dishes. Preheat oven to 400 degrees. In a large bowl, combine all ingredients and mix well. Place mixture on a rimmed baking sheet and bake for 20 minutes. Remove from the oven and stir the mixture. Bake for an additional 20 minutes or until fork tender. Choose beets with firm, smooth skin and leaves that are not wilted (if still attached.) Smaller beets are more tender and sweeter than larger beets. When cooking beets whole, roasting beets with their skin on helps keep the nutrients and the color. The skin will easily rub off under cold running water after they are cooked. To clean your beet juice-stained fingers, rub with some salt and lemon juice, then wash with soap and water.